Citation: Sarbani D, Santanu N. An unusual branching pattern of the axillary artery. Int J Anat Var. Mar 2019;12(1):010-012. Variations in the branching pattern of axillary artery are frequently found. Knowledge about the variations in the branching pattern of Axillary artery is important for surgeons to avoid intraoperative injuries in axilla. 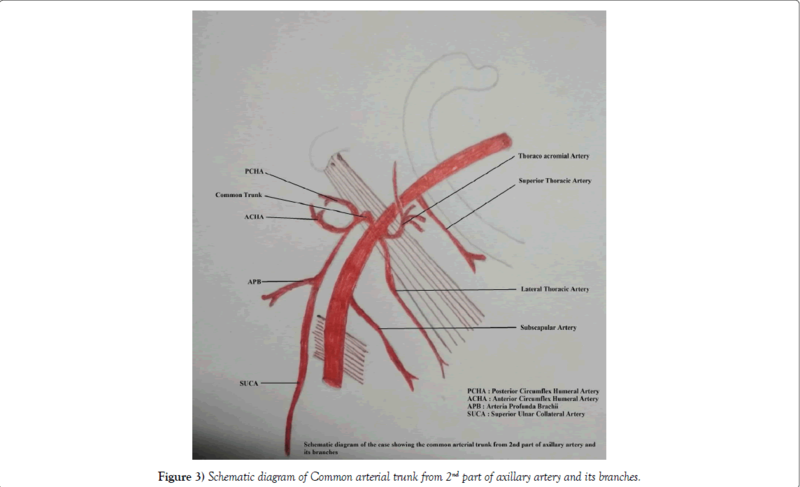 An unusual unilateral variation in branching pattern of axillary artery was found during routine undergraduate dissection in Medical College & Hospital, Kolkata. Variation consist of origin of a common arterial trunk from the 2nd part of axillary artery which was giving rise to 4 branches namely, Anterior & Posterior circumflex humeral artery, Arteria profunda brachii and superior ulnar collateral artery, rest of the branches were as usual. Subclavian artery is continued as Axillary artery from the outer border of first rib up to lower border of teres major muscle. Pectoralis major musce divides the axillary artery into 3 parts, which give rise to 6 branches. The branches are Superior thoracic artery from first part, lateral thoracic & thoracoacromial artery from 2nd part and 3 branches from 3rd part, which are lateral thoracic, anterior & posterior circumflex humeral artery. Considerable variations in branching pattern of axillary artery have been described before by many authors. Knowledge of these variations will definitely help surgeons performing different operative procedures in this region namely-coronary bypass, reconstructive surgical flaps, reduction of old shoulder joint dislocation, axillary LN dissection etc. Our aim is to provide information regarding an unusual branching pattern of axillary artery. During routine dissection of upper limb of 2018-2019 batch for 1st prof MBBS students in the Anatomy department of Medical College & Hospital, Kolkata we found unique unilateral variation of branching pattern of right Axillary artery in a 60-years-old male cadaver. From 2nd part of the right axillary artery along with the thoraco-acromial and lateral thoracic artery, a common trunk arises from the posterior aspect of axillary artery. This common trunk gives rise to anterior circumflex humeral artery, posterior circumflex humeral artery, arteria profunda brachii and superior ulnar collateral artery. Subscapular artery arises from the 3rd part of axillary artery as usual. Branches from the axillary artery of left axilla were vas usual. Variations in the branching pattern of the axillary artery have been reported by many authors. Saeed et al.,  reported a case where a common arterial trunk originated from the 3rd part of axillary artery which gave rise to subscapular, anterior circumflex humeral, posterior circumflex humeral, profunda brachii and ulnar collateral arteries. Vijaya et al. found a common trunk arising from the 3rd part of axillary artery, the same divided into anterior circumflex humeral, posterior circumflex humeral, subscapular, radial collateral, middle collateral and superior ulnar colateral arteries. Profunda brachi artery was absent in that case. Bhat et al. observed a case where from 2nd part of axillary artery a common arterial trunk originated and gave rise to the thoracoacromial, in addition to the lateral thoracic, posterior circumflex humeral and subscapular arteries. Anterior circumflex humeral artery was found to arise from the 3rd part. Iliev et al. reported a case where PCHA arose as a branch from the brachial artery instead of axillary artery and it ran below the lower border of teres major muscle, where it gave origin to deep brachial artery and then followed its usual course to anastomose with anterior circumflex humeral artery. Stanchev et al. found a case showing bilateral variation in branching pattern of axillary artery. On the right side they found two profunda brachii arteries arose from the axillary artery along with other usual branches of axillary artery. The axillary artery then bifurcated into superficial brachial artery (SBA) and deep brachial artery (DBA). SBA after giving muscular branches in the arm, continued as radial artery. The DBA after giving rise to superior ulnar collateral artery and inferior ulnar collateral artery itself continued as ulnar artery. In our case, 1st branch of axillary artery (rt) showed no variation. However 2nd part was giving rise to 3 branches thoraco-acromial, lateral thoracic artery and a common trunk from posterior aspect of axillary artery. The common trunk gave rise to anterior & posterior circumflex humeral arteries and continued below along the lateral side of median nerve and gave arteria profunda brachii and itself continued as superior ulnar collateral artery which was accompanying the ulnar nerve on the medial aspect of arm (Figures 1-3). Figure 1: Dissection of right axilla showing branches of Axillary artery (AA). CT: Common Trunk from 2nd part of AA; LTA: Lateral Thoracic Artery; PCHA: Posterior Circumflex Humeral Artery; ACHA: Anterior Circumflex Humeral Artery; SUCA: Superior Ulnar Collateral Artery; UN: Ulnar Nerve; MN: Median Nerve; APB: Arteria Profunda Brachii; TAA: Thoraco Acromial Artery. Figure 2: Dissection of right axilla showing branches of Median nerve (MN). CT: Common Trunk from 2nd part of AA; MN: Median Nerve; AA: Axillary Artery. Figure 3: Schematic diagram of Common arterial trunk from 2nd part of axillary artery and its branches. Formation of major arteries of the extremities is a complex process in which several major arterial trunks successively take ascendency and then regress, to be replaced by still other major vessls. Such variations in the branching pattern of axilary artery occurs [4,6] due to defects in the embryonic development of the vascular plexus involving 7th somatic intersegmental artery. This may be due to an arrest at any stage of development of vessels followed by regression, retention or reappearance, thus leading to variations in the arterial origin and course of major upper limb vessels. Knowledge about the branches of axillary artery is necessary during different operative procedures like coronary bypass, using medial arm skin flaps, reconstruction of axillary artery after trauma, using the branches of axillary artery for the use of microvascular graft to replace the damaged arteries and many more. Saeed M, Rufai AA, Elsayed SE, et al. Variations in subclavian-axillary arterial system. Saudi Med J. 2002;23:208-12. Vijaya PS, Venkata RV, Satheesha N, et al. A rare variation in the branching pattern of the axillary artery. Indian J Plast Surg. 2006;39:222-3. Bhat KM, Gowda S, Potu BK, et al. A Unique branching pattern of the axillary artery in a South Indian male cadaver. Bratisl Lek Listy. 2008; 109:587-9. Iliev AA, Mitrov LG, Georgiev GP. A variation of the origin and course of the posterior circumflex humeral artery and the deep brachial artery. Clinical importance of the variation. J Biomed Clin Res. 2015;8:164-7. Stanchev S, Iliev A, Georgiev GP, et al. А case of bilateral variations in the arterial branching in the upper limb and clinical implications. Chronic J Clin Case Reports. 2017;1:006. Hamilton WJ, Mossman HW. Cardiovascular System. In: Human Embryology. Williams and Wilkins, Philadelphia, Pennsylvania, USA. 1972; pp:271-90.